Sadly, not everyone reads everything on these wedding planning pages comprehensively - it would be impressive if everyone did. Not even our staff will read everything on this site, so if you did read it all, you could tell us a thing or two! Yet most things that go wrong we’ve seen before and warned against, somewhere in our advisory notes. 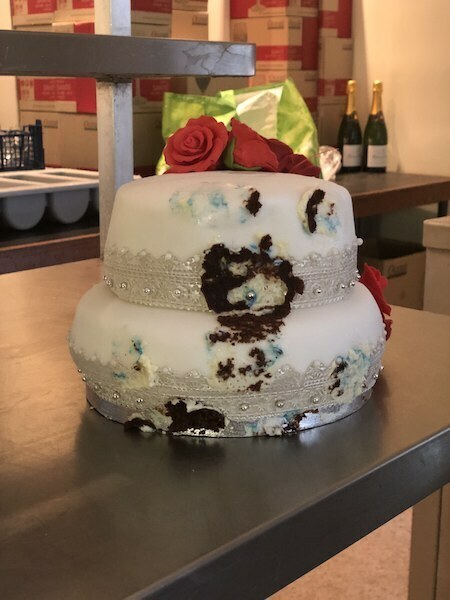 And though our Page on Wedding Cakes has been on the Wedding Planner section of the website for several years, we still see cakes that collapse (mostly in-transit issues). A professional cake maker should know how to get it right. It's the centrepiece of your wedding reception room display, for the most important day of your life, which is probably why Suppliers charge a tidy sum for a wedding cake. You may also have to wait months for a specialist cake to be made so need to book your wedding cake and choose your design well in advance. We’ve just had an Eastern European Wedding Cake prepared by a close relative collapse in to a messy mush. Naturally we have every sympathy for the Wedding Couple who must have been devastated. This is just not something you want to have happen on your Wedding Day. Apparently, this particular style of cake has an infill of fluffy whipped cream, at least this one did. This does mean it has to be made and eaten within a very short time frame, which is maybe why it was not made by a traditional wedding cake maker. Indeed, I have bought lovely creamy chocolates, both Russian and Polish in a shop in Swansea (not fresh cream but a marshmallow interior), that have these same creamy fluffy interiors. They're gorgeous. So I can see this probably is how an Eastern European Wedding cake might be made. They must taste very 'light' and fresh. But add on several tiers with weak structural supports and a base of fresh fluffy light cream is not going to work. All went fine until the upper tiers went on to the whipped cream filled base. Without support, the result was highly unfortunate, compounded by the fresh newness and hence softness of the external icing (the cake must have been so fresh the icing had no time to harden). Logically if you put something heavy onto a soft and light base, you are going to have a collapse. On arrival the Bride was not sure whether to put it in the fridge, and, unaware of its interior of fluffy cream, our in-house Wedding Planner merely advised that refrigerating icing can make the icing go hard, which it can. Had we known it had a fresh cream interior, our advice would be that it needs to be refrigerated, as cream will go sour otherwise. Anyway, it was left out of the fridge overnight, in a reasonably cool room beside the Wedding Banquet room. Not that this would make any difference to its weight-bearing properties, or lack thereof. When I saw the remains, it had been moved to the cold store, for with the interior exposed, we could see the fresh fluffy cream. With the various tiers placed on top, gravity took over. We've remade cakes in the past with some success, typically when they get damaged in a car in transit to the venue, but this very soft cake was so spectacularly beyond repair there was nothing anyone could do. The poor bride! It was clearly a superb cake with lovely icing, all so painstakingly made, so much had gone into it, that this just is not something anyone wants or expects. Closer inspection of this home made cake also shows it did have construction pillars but these were too thin with sharp tops. The idea was sound, for internal pillars had correctly been factored in - but they were too thin so had no stability. The answer for a soft freshly made cake like this is ideally to use a tiered cake stand, or one like this (apologies if links are broken - search on Google for 'tiered wedding cake stands' to find more). We are hoping to get some ourselves but you do need the right size and strength of stand for your cake, as they come in different sizes. You can either go for a silver colour or a see-through effect. You can find many varieties of design if you search on 'google images'. Alternatively, if making your own cake, you'll need to go a bit overboard with quite substantial (thick and flat topped) support pillars, which you should be able to buy on-line. These need to go through the soft base cake itself (not rest on top) and to rest directly on the surface of the baseboard the bottom cake is sitting on. The same process needs to be applied to any upper levels in turn, the pillars of each resting in turn upon the baseboard for the upper tiers. This may not be so necessary with a fruit upper tier, and where the icing has hardened to provide its own support. In the above example, the design does not allow for cake stands between the tiers, rather the upper tiers are laid loose on top of each lower tier. In this instance, the support pillars would terminate at the top of the base layer, and probably the upper tiers should each be resting on a thin base in turn, with a discreet gap between each tier, so they can be lifted clear off the lower levels for cutting. Otherwise, with soft icing, you are going to pull icing off the top of the lower levels as you remove the upper tiers for the cake cutting. A lightweight base will not carry the weight. The reason you need quite thick pillars within a sponge or lighter mix is to prevent them twisting and moving within the base cake. This can happen if you are carrying the assembled cake around a venue, moving it around the sideboard or to different parts of the room for photos, or even, cutting it without separating the tiers (normally though you cut it having separated the tiers). Your pillars also need wide flat tops so the cake tier above does not sink into the narrower pillars, though if the upper tiers are resting on a baseboard this won't be necessary. Sorry to be so technical but this is the most important cake you will likely have on display in your life! 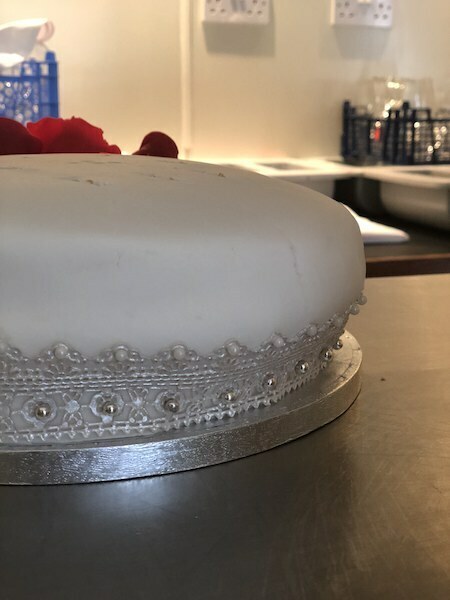 If using an experienced wedding cake maker you should not need to concern yourself with any of this, but even the professionals can get it wrong occasionally. Insufficient support generally means the cake will either 'lean', sag, or collapse. 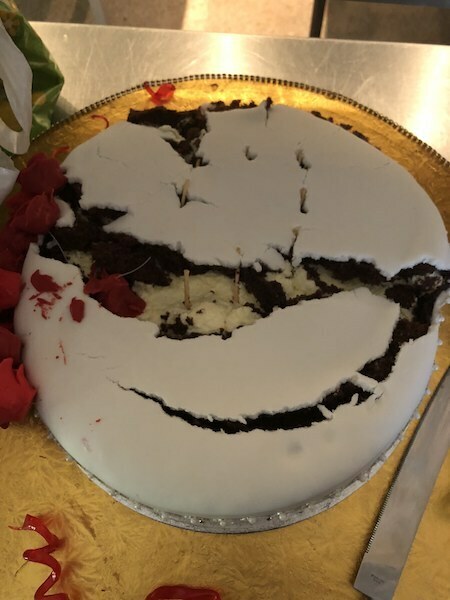 Our thoughts and sympathies are with the Bride and her party, and indeed the relative who made the cake, whose efforts, so well-meaning and so creatively expressed in such a lovely design, were undone by an architectural / structural problem.